In the UK, the use of closed-circuit television (CCTV) to monitor and survey people and premises has become quite commonplace. More and more we see a need for CCTV surveillance on both commercial units and private sites. Networklife Group has a wealth of experience installing CCTV systems to secure any site. We understand the need for clear, reliable systems that are easy to use and maintain. A basic CCTV system typically includes a camera connected to a monitor and a recording device. More advanced systems can grow to a network of cameras, linked to sophisticated control equipment. This is ideal for commercial businesses and organisations that need to maintain larger premises. Recent developments in digital recording techniques have also enabled automatic recording of high quality images. It is now commonplace to view CCTV images via the internet or a handheld mobile device. The systems we fit are suitable for small, medium and large commercial units, covering a range of a surveillance scenarios. Networklife Group is pleased to be able to provide solutions for the growing market in IP camera systems. 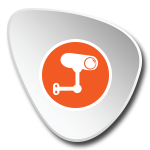 A great benefit of IP camera (network camera) systems is that footage can be viewed via the internet. We can give you an up-to-the-minute, state-of-the-art CCTV solution that integrates with your current IT system. Please ask us for more information on how we can make this work for you.